That may be the most famous quote from the father of modern foraging, the late, great Euell Gibbons, who spoke those words in a Grape Nuts commercial back in the 1970s. He’s right, of course, and I’d like to walk you through just which parts he’s talking about. No, it ain’t the wood, silly. And it ain’t the bark, either, although some people have eaten the inner cambium bark of some conifers and declared it tasty. It takes like resinous, tannic wood to me. Meh. 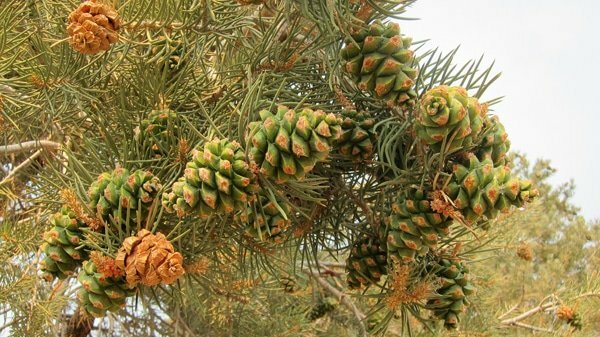 The true gifts of the pine — and for the sake of this article by “pine” I mean all conifers — are their nuts, pollen and needles. Most of us have eaten pine nuts. Few of us have eaten North American pine nuts. Something like 95 percent of the commercial market in pine nuts is from China and Korea, and while these nuts are nice, they are occasionally adulterated with nuts from another pine that will make your mouth taste metallic for several days: This is the dreaded “pine mouth.” (I know how much it must shock you to learn that the Chinese sometimes adulterate the foods they export… ) I can assure you, North American nuts will not do this. P. edulis, the two-leaf piñon, is centered around Colorado, Utah, Arizona and New Mexico, although it can be found in scattered places elsewhere. It also likes open, arid scrub. Both trees can live for more than a century. Single-leaf pine nuts are the largest pine nuts I know of, sometimes longer than an inch. Edulis pine nuts are much smaller, about the size of a store-bought nut; their cones are also teeny, much smaller than you’d think. A big one will still fit in the palm of your hand. Single-leaf nuts are pretty mild, and they’re softer than most other pine nuts, almost gummy when raw. I always toast them. Edulis nuts are virtually identical to the Chinese ones, although I prefer their flavor, which is stronger than the imported nuts. The trick to harvesting these pine nuts is to get on it early, like in August or early September. I’ll get into exactly how to harvest pine nuts in a post later this summer. Several other pine trees have good nuts, all in California. Sorry folks, but there are no pines east of the Great Plains that have nuts large enough to bother with, unless you have a Western transplant or an Italian stone pine nearby. Sugar pines, P. lambertiana, have gigantic cones loaded with good nuts, but good luck getting to them before squirrels do. Sugar pines are our tallest pine and the cones are often 100 feet in the air when they ripen. Still, if you are diligent you can get some in September. Even closer to home — or at least my home — is the bull or gray (or digger) pine, P. sabiniana. This is a huge pine with a raggedy look to it, and it bears the largest cones of all. If one falls on you, chances are you’ll get knocked out, or worse. I’ve written about cracking these nuts before, and it was a futile endeavor. Gray pine nuts taste fantastic — very strong — but they have a really hard shell. I gave them up a few years ago. Until I saw a bunch on the ground last month. As it happens, the cones of the gray pine open in spring, and the squirrels and birds go to town on them. They’re messy eaters, so many good nuts drop to the ground right under the trees. I soon found I could gather more nuts on the ground than I could by prying them out of their evil, hooked cones. I quickly gathered a pound one day just by looking on the ground. But there was still the problem of opening the little bastards. On my way home, I contemplated it. I’d noticed that most of the opened nuts had been opened on their narrow axis; the nuts are lens-shaped in cross section. That meant there must be a hidden seam there, like on a walnut. How to open that seam? Then it hit me: Vise grips. A set of grips clamped down on the narrow axis of the nut should crack it cleanly and easily. It does! All of a sudden, the nuts of the gray pine are valuable to me again. It’s those nuts that are in the dish you see at the top of this post. The gray pine also gave me another gift this spring: pollen. I’d known pine pollen was edible, and indeed many people say it’s a wonder food. I’d hit on exactly the right moment to harvest the pollen, and gathered enough to have some fun with pretty quickly. All you need to harvest pine pollen is a plastic bag and some good timing. You’re looking at anywhere from April to July, depending on your climate. Watch for the “yellow ash” falling everywhere, and when you see it, get on it — the pollen won’t fall for long. It does store for quite some time, however, so you can keep it in a glass jar in the cupboard for when you need it. Even if it’s not a magic tonic, pine pollen is certainly nutritious, and while the pollen in other pines, notably the Jeffrey pine (P. jeffreyi), can be bitter, that of the gray pine is pretty neutral. It’s good added to anything you’d make with flour. I decided it would make a great pasta additive. It does. That leaves the needles. 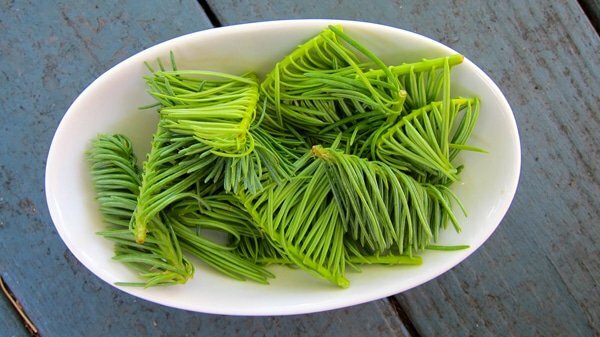 Yes, you can eat pine needles, and they do make a pretty good tea, but I’ve found that the needles of pine’s cousins, the firs and spruces, taste less like turpentine and more like citrus. There is a good reason they all have at least a little bit of citrus flavor: The needles of conifers are a good source of Vitamin C. Many people use them as a tea, and I like that, although I’m not much of a tea drinker. I prefer to make fir or spruce tip syrup, which I then use as a glaze on poultry (especially grouse), and as a soda base or in gin martinis. To gather them, look for the light-colored tips of the trees; this is the new growth, which is milder and less resinous. Every tree will taste a little different, so taste in the field to make sure you don’t get one too nasty. If you happen to find an especially citrusy tree, mark it down. Never pick the new growth at the top of a little tree, as this can stunt it. Pick around the edges, a few tips here, a few there. Don’t overharvest any one tree. Stick and move and you can still put some weight in your bag. And after all, you don’t need much. Once you have them, they will keep a week or so in the fridge, but I like to vacuum seal the tips and freeze them. Sealed, the tips will last a year. Armed with all three gifts of the pine, a few weeks ago I decided to make a dish celebrating them. As you may or may not know, I make a lot of pasta, so a pine pollen pasta was a must. I chose this particular shape because it kinda reminds me of little pine cones. The addition of the pollen and a tiny amount of piñon pine essential oil (which gave them a heavenly aroma) added to the effect. Here in the West, morel mushrooms live with conifers, mostly firs. I happened to have had a good day with them at the time, so in they went, too. 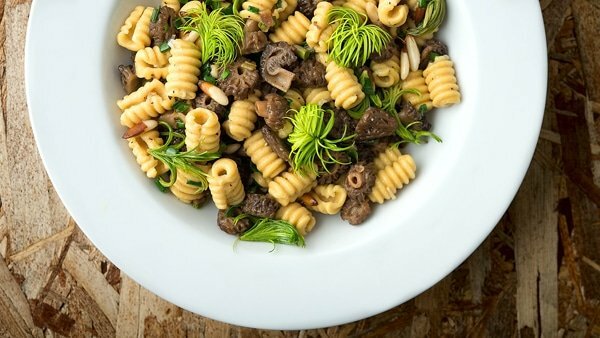 I added a big handful of toasted pine nuts, a few wild onions from the edge of the forest, and garnished the whole dish with the fir tips. I loved the dish. It brought together every element of the pines, and created an overall plate full of flavors even I hadn’t tasted together before. I’m giving you the recipe below, even though I am not sure who will actually make this dish. Chefs, maybe. Other manic foragers like me perhaps. But I do know that if Euell were still alive, this is what I’d serve him. I hope he’d be proud. I make no apologies for this recipe. Yes, it will be hard to recreate at home. But not impossible. And the real point is to bring together all the gifts of the pine in one dish. 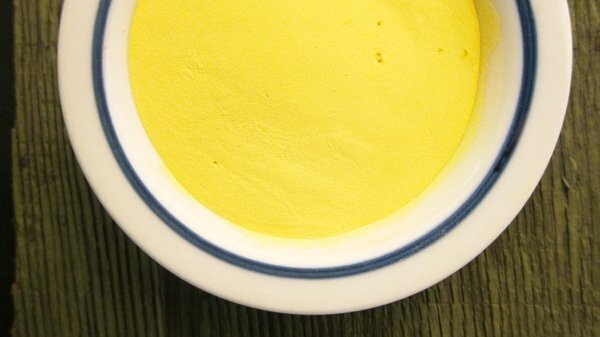 The pine pollen, which you can buy in stores or online, is a nice touch in the pasta, but it adds more color than flavor. Pine nuts you can buy. 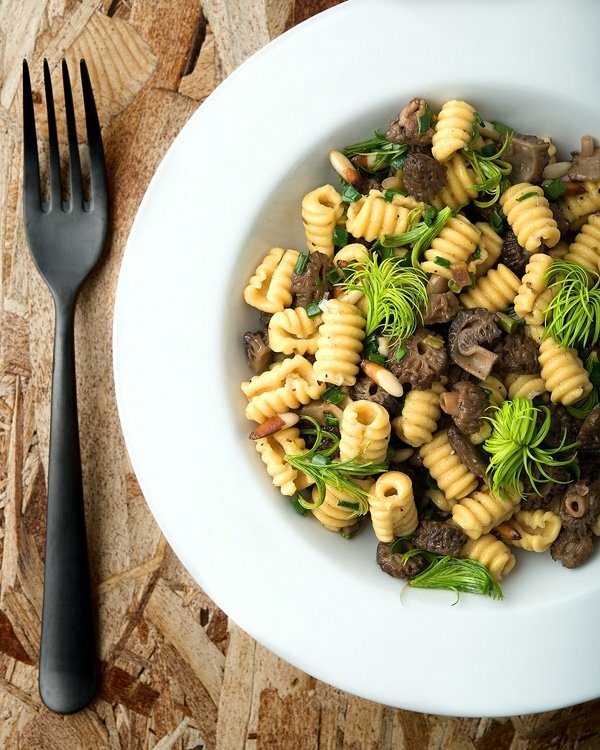 Morels, too, although this dish is better with fresh ones than dried. The demi-glace, which is a thickened, reduced stock, you can either buy or use this recipe to make yourself. Make the pasta first. Whisk together the pine pollen and the semolina. Add the pine oil to the water and pour it into the flour. Mix well and knead for a solid 5 to 8 minutes. This is a stiff dough, but it will incorporate eventually. Wrap the dough in plastic wrap and leave it out on the counter for an hour or three. Or, if you have a vacuum sealer, seal the dough. You can then work with it pretty much immediately, as the vacuum instantly hydrates the dough. When you're ready, shape the dough so you can cut it into 4 to 6 equal pieces. Keep all the pieces you are not working with covered in plastic wrap. Roll the piece of dough you are working with out into a snake the thickness of your little finger. Cut it into pieces about as wide as your first finger. Use a gnocchi board to roll off each cavatello, using enough pressure with your first finger (or two fingers if the pasta bit is wide) to make the center part of the cavatello thin. You'll get the hang of it quickly. Set your cavatelli on a baking sheet you've dusted with some semolina. Get a large pot of water boiling and salt it well. You want it to taste like the sea. Put the morels and the white parts of the chopped wild onions into a large saute pan dry. Turn the heat to high and wait for them to sizzle. When they do, drop the heat to medium-high and stir them around a bit. They will release their water. Salt them when they do. When most of the water has boiled away, add the butter and toss to combine. Sear until the morels start to brown. Add the pine nuts, champagne and glace de viande and boil furiously until the liquid has almost boiled away. Turn off the heat and add the green parts of the wild onions and toss to combine. Boil the pasta, removing it about 30 seconds after it floats to the surface. Add it to the saute pan, along with some black pepper and the fir tips. Toss to combine and serve at once. The fir tips you'll need to gather yourself. They're ready from March in hot, low elevations up until early July in the mountains. Incidentally, you will want to chop them for the dish, unlike in the picture. Big pieces of fir tips were too much of a palate wrecker. WOW! Amazing! I always have a jar of needle tea in the refrigerator. I live in the north east in Pennsylvania and morels hard to come by (tho I’m always looking) the nuts are hard to come by also but pines are everywhere. Last fall I found an amazing 5 lb Grifola Frondosa! So delicious!!! I can’t wait to get some pollen and figure out what nuts I can crack! Beautiful post! 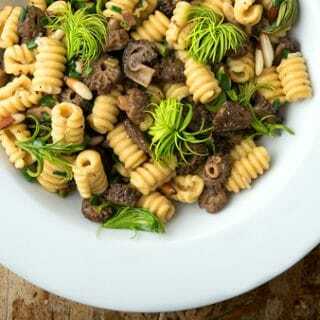 I love that you put pine pollen in the pasta. I’m curious if you have ever harvested cedar pollen? It’s bursting out of the cones right now since it’s fall, and I’m curious if it’s as delicious as it’s brother’s pollen.